Since the summer, two parabolic trough collectors have been drying sludge at a waste water treatment plant in Surprise in the state of Arizona, USA. The test project was developed by US-based Heat2Hydro to evaluate the effectiveness of this solution. The objective is to reduce the water content of the sludge and make it easier to transport. The municipality aims at expanding solar drying capacity to 5 MW thermal in about two years. Sludge is a by-product from cleaning municipal sewage at waste water treatment plants. Removing the water from the sludge creates dry biosolids with reduced weight, and they can be transported at significantly lower costs than wet sludge. Moreover, these biosolids can then be used as fertilizers in agriculture. Heat2Hydro used two parabolic trough collectors with a length of 33.58 metres each from Canadian manufacturer and designer Rackam. Water is heated in an evacuated absorber tube to 121 °C at 5 bars, pumped via underground pipes and transferred to a storage tank. From there, the hot water circulates through pipes, which were laid in the drying beds filled with sludge. The two rows of Rackam collectors S20 with a total mirror area of 150 m² generate heat at an effective power of 98 kW. The mirror / solar power ratio was estimated at 0.643 kW/m². The on-field performance of the solar thermal system has demonstrated that biosolids with less than 10 % water content or more than 90 % solid content can be produced thanks to the solar drying process. According to Rackam, the Surprise municipality aims at scaling up the solar thermal system to 5 MW to treat the city's entire sewage by 2020. 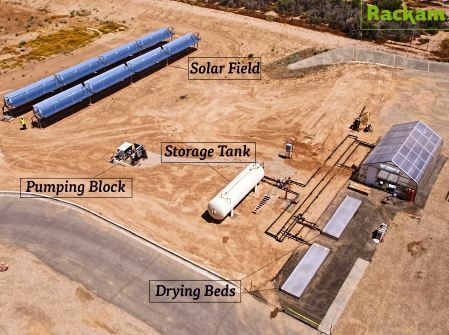 “This larger solar field,” said Jacques-Alexandre Fortin, Vice President at Rackam, “will have an active mirror area of 7,700 m² and an expected turnkey cost of about 1,000 USD/kWth, with a payback time between 5 and 7 years for the solar field.” The company expects the specific annual yield to be around 650 kWh/m² for the large 5 MW plant, even though the performance of the much smaller demo plant is about 10 % above this level because of more frequent cleaning and more intensive maintenance of the small plant. Heat2Hydro, Inc. is a New York-based company delivering solar thermal solutions for industrial applications (primarily food processing, mining and sludge drying), electric power and water treatment and processing (desalination, purification and decontamination). Rackam is a company from Sherbrooke, Canada, which started developing solar heat solutions for industrial processes in 2009. With 20 staff, the company manufactures its own parabolic trough collectors and has installed 3,183 m² of solar thermal plants throughout the world so far. Rackam reported projects totalling 13,286 m² to be in the pipeline.